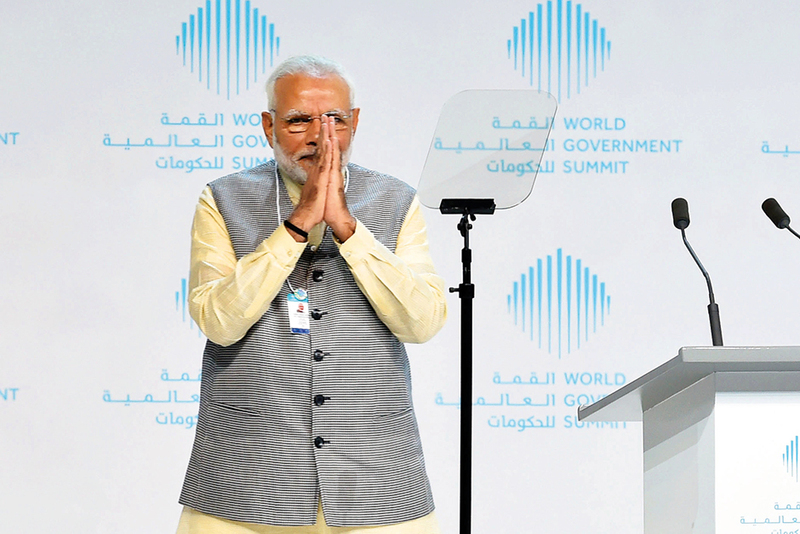 Dubai: India’s priority is technological advancement, especially in education and energy, Prime Minister Narendra Modi told the World Government Summit (WGS) in Dubai on Sunday. His keynote talk, presented as the day’s main address from the WGS guest country — India this year — was heavily focused on technology as a driver of human advancement, in general as well as in particular to India. Modi’s delivered the key note address in the presence of His Highness Shaikh Mohammad Bin Rashid Al Maktoum, Vice-President and Prime Minister of UAE and Ruler of Dubai; Shaikh Mohammad Bin Zayed Al Nahyan, Crown Prince of Abu Dhabi and Deputy Supreme Commander of the UAE Armed Forces; other shaikhs and thousands of summit attendees. Addressing a packed arena hall, Modi said his priority sectors include, among others, providing long distance online education for poor children in remote parts of India and developing the country’s solar energy storage capability. The prime minister, who was on a two-day official visit to the UAE, said India aims to generate 175 gigawatts of power from renewable energy sources, including solar, by 2022. “And the next big technological revolution will be in the storage of solar energy,” Modi said. He gave the example of depletion of ecology by urbanisation as well as radicalisation. He also listed various digital and technological advancements under his government in India — such as biometric registration of people and farmers being able to sell through online portals. The premier also mentioned India’s initiative of a “solar alliance” to allow less-developed countries to benefit from solar power. Modi said India has assigned special significance to the sun since ancient times and will continue to harness its power. Tracing technological progress in India since ancient times, Modi said the country has reached the space sector. He gave the example of India’s Mars orbiter as well as the 100 satellites it has launched, including one for the UAE, which serve purposes in communications, data transmission, geological monitoring, and other ends. Modi said India managed to enter the space sector in a cost-effective way, pointing out that the Mars orbiter cost less than “your average Hollywood movie”. He added that on a per-kilometre basis, the orbiter “is cheaper than taking a taxi ride in the city” — costing Rs7 (Dh0.39) compared to the Rs10 taxi fare. Highlighting other areas of digital progress in India, Modi mentioned its Adhar biometric identity cards for all citizens, said to be the world’s biggest such project. India has a population of around 1.25 billion people. Modi said that because of the cards, which are linked to bank accounts and mobile phone numbers, citizens can avail of a direct transfer of government benefits to them. However, technology can and has also been used sometimes as “a tool of destruction” rather than for progress, Modi warned. “Governments should remain alert towards technological development so technology remains useful. Its user manual says nothing about moral values,” he said. Speaking on national development, Modi said the goal of mankind was not to strive for economic prosperity per se but to work together towards well-being. He recited a Sanskrit saying that means contentment is the real and highest wealth of man. Modi said the UAE leadership has “very accurately realised this ideal”, citing the appointment of a Minister of Happiness and Quality of Life as an example. He also praised the forward-looking vision of its leaders, pointing out the creation of a post of Minister of the Future in the UAE. Modi said WGS was an ideal platform to explore how technology can change the future of governance.